December 11, 2009 - The U.S. Army awarded $247.2 million contract to EADS North America for the Lakota Light Utility Helicopter. A helicopter equipped to provide medical evacuation, personnel transport and multimission applications. "The Army has great confidence in the Light Utility Helicopter program, and to preserve the momentum of this successful ACAT-1 system, we awarded the Fiscal Year 2010 contract at the earliest point allowed," said Keith Roberson, the Deputy Project Manager for Utility Helicopters at the U.S. Army’s Program Executive Office for Aviation. “The UH-72A program is a key element in the U.S. Army’s aviation modernization effort, and we are committed to providing the very best helicopters for America’s warfighters,” said Sean O’Keefe, EADS North America Chief Executive Officer. The Fiscal Year 2010 contract ensures continuity of UH-72A deliveries from the stateof-the-art facility in Columbus, Mississippi – which is operated by EADS North America’s American Eurocopter business unit. The Lakotas delivered to date by EADS North America are based at U.S. Army and National Guard locations from coast-to-coast in the United States, as well as in Puerto Rico. 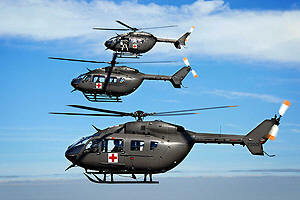 Future deployments of UH-72As are anticipated in the Pacific, Europe and Japan. Five H-72A versions of the Lakota are being delivered to the U.S. Navy for pilot training at the Naval Test Pilot School at Patuxent River, Md. In addition, a variant of the UH-72A is being proposed by EADS North America as a new armed scout helicopter solution for the U.S. Army – the Armed Scout 645.